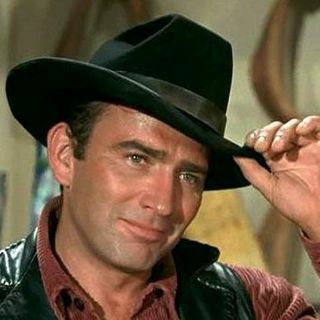 James Child Drury, Jr. (born April 18, 1934) is an American actor probably best known for his success in playing the title role in the 90-minute weekly Western television series The Virginian, broadcast on NBC from 1962–1971.Drury was born on April 18, 1934, in New York City, where his father James, Sr., was a New York University professor of marketing. He grew up in both New York and Oregon. Drury contracted polio at the age of ten. In 1959, Drury was cast as Harding, Jr., in the episode ... See More "Murder at the Mansion" of Richard Diamond, Private Detective. On May 9, 1959, early in his career, Drury appeared as Neal Adams in the episode "Client Neal Adams" of ABC's western series Black Saddle. In the story line, Adams is an old friend of series protagonist Clay Culhane, a gunfighter-turned-lawyer played by Peter Breck. Adams has robbed a bank of $8,000 and was subsequently shot in the back by a pursuing bounty hunter, played by Charles Aidman. Adams asks Culhane for help and makes the false claim that the bounty hunter is the brother of a man whom Adams had earlier killed in self-defense. In 1960, Drury appeared in different roles in two episodes, "Fair Game" and "Vindication" of another ABC western series, The Rebel, starring Nick Adams as a Confederate adventurer roaming through the post-Civil War American West. On November 16, 1960, Drury played young pioneer Justin Claiborne in the episode "The Bleymier Story" of NBC's Wagon Train, broadcast just days after the death of series lead Ward Bond. Robert Horton as the scout Flint McCullough struggles to get a wagon train through a Sioux burial ground. Dan Duryea played the mentally unstable Samuel Bleymier who is obsessed by demons and superstitions. In 1960, Drury portrayed Joe Darle in the episode "Wall of Silence" of the ABC/Warner Brothers detective series, Bourbon Street Beat, set in New Orleans and starring Andrew Duggan. He made a memorable guest appearance on the CBS drama series Perry Mason in 1961, as he played the role of musician and defendant Eddy King in "The Case of the Missing Melody," with Raymond Burr.He appeared in secondary roles for Walt Disney. In 1962, he was cast in a substantial role as a lascivious gold prospector in the early Sam Peckinpah western Ride the High Country opposite Randolph Scott and Joel McCrea. Also, in 1962, Drury landed the top-billed leading role of the ranch foreman on The Virginian, a lavish series which ran for nine seasons. Drury was in the oil and natural gas business in Houston at the turn of the 21st century. His son, Timothy Drury, is a keyboardist, guitarist and vocalist who has played with the rock groups The Eagles and Whitesnake. Drury was a close friend of the Houston marksman Joe Bowman, who trained numerous actors on how to use weapons. Drury is also the longtime best friend of both Robert Horton and Robert Fuller, since 1954, where the three met while under contract at MGM Studios. Together (along with Horton, until his final appearance in 2011, and 5 years before Horton died in March 2016), they attend the annual Festival of The West in Scottsdale, Arizona, among other Western Festivals.